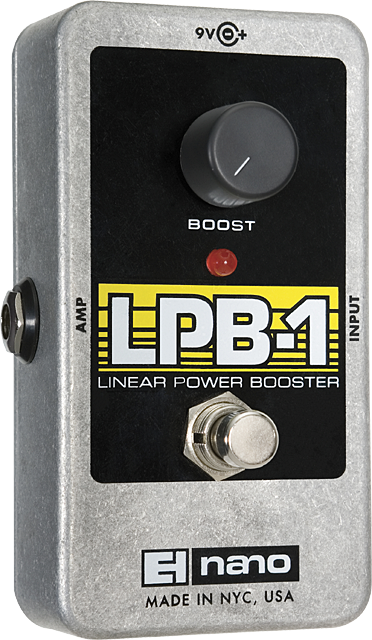 LPB-1, Guitar/Bass booster from Electro-Harmonix. Skjold's review"You get what you pay for!" This is one simpel pedal without any hazzle. It's small, fits into any tight occupied pedal board, does its job and doesn't cost a fortune. What more do you want? You get a die cast housing, volume knob, an input and an output jack and finally an on/off switch. It utilizes a red LED light to indicate weather it's on or off. It can run on either a 9 Volt battery or a power supply. Yes, you can ask for more then what you get. First of all the volume knob is so unbelievably sensitive, which makes it hard to dial in the correct amount of boos. You don't know how many dB you boost your signal. In a studio enviroment, somebody might find this info useful - Others would just ignore it. In the setup I run at the moment, I can't dial up the boost pedal that much. Only a few percent of its total range. This has also made me tape down the button, so that I won't accidentally hit it, while activating the boost. Some sort of an internal range switch would be nice, in order to keep this problem in check. But for the price range this pedal is in, that wound be an option. I've tried this pedal on several amps and with several guitars. When throwing it into the signal chain, I don't notice any high end loss. And there is no need to worry when you hear a slight hiss, when the pedal is cranked all the way up. You have to be careful where you place the pedal, when you use a solid state amp. If you place in front of the pre-amp you'll only get a gain boost and not a volume boost as such. In order to get the volume boost, you need to place it in the amps effect loop. I've never had any other clean boost pedals, but I must say that I'm pretty impressed by this EHX. This one is build like a brick, doesn't take a lot of space on the pedal board. You have a wide variety of options with it, such as volume unification between several guitar with different output, regaining lost signal strength after a long signal chain or just provide a plain and simple volume boost for a solo. The different volume pedals doesn't cost that much and de difference between them are minute. So if cost is a factor, you can't go wrong with this one. Should it break, you just go and buy a new one. Not excellent, but in no way bad as well. 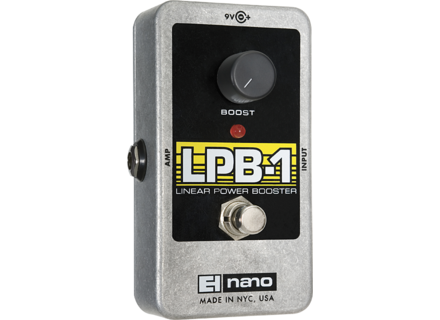 The Electro-Harmonix Nano LPB-1 Power Booster is one of the most basic pedals you will find. An input from your guitar, an output to your amplifier, a power jack and one volume knob, and that’s it. 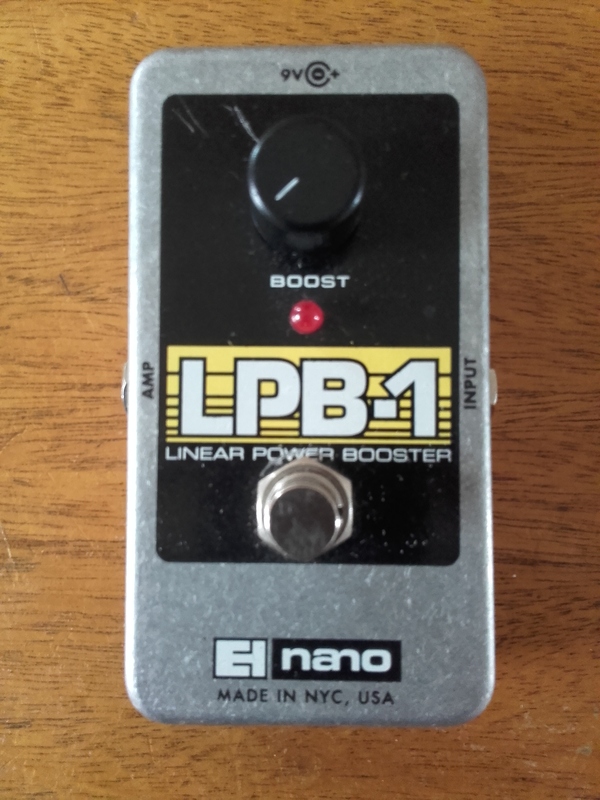 Being from Electro Harmonix’s Nano line, this pedal has a small footprint and will fit on anyone’s pedal board. There is a red LED that lets you know when the pedal is engaged and the pedal can be powered by a 9 volt battery or by an additional power supply. Much like the MXR Micro Amp, this pedal is a one trick pony, but you are able to use that trick in many different ways. Basically all this pedal does is boosts your signal, and this will do different things depending on where you put it in your signal path. In front of a tube amp this pedal can push you over the edge if the amp is set on the verge of breakup, while retaining your tone. 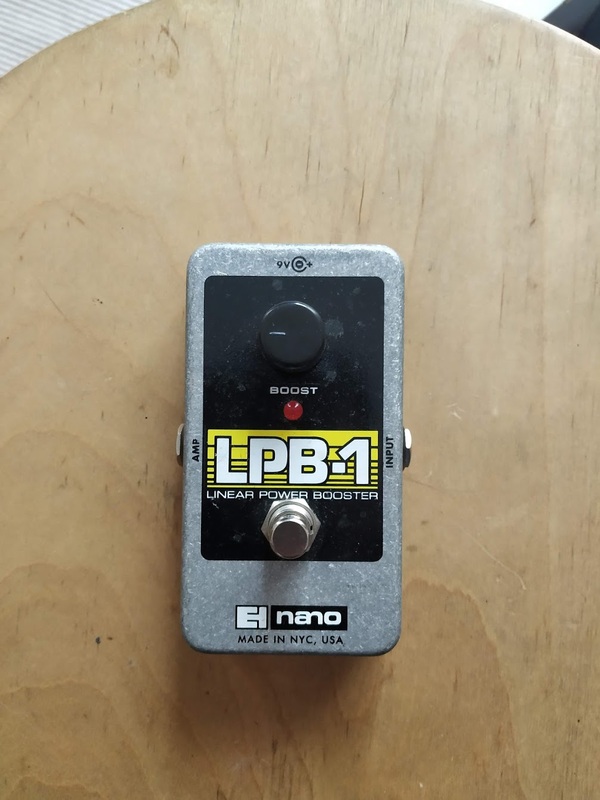 When used in the effects loop of an amp this pedal can provide a huge boost in volume if needed that is much cleaner than when it’s used in front of the amp. This pedal is also handy to match the volume of guitars. For example if you use low output single coils in a Stratocaster and then switch off to a hot rodded Les Paul there will be a change in volume during a gig. 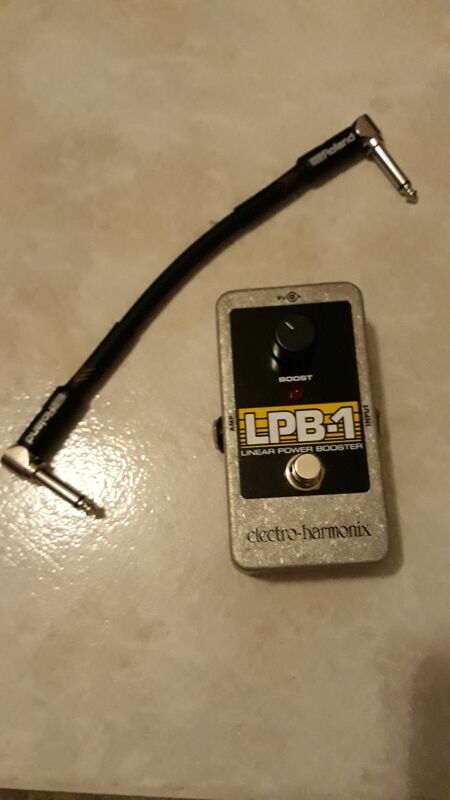 Kick this pedal on while you play the Strat and off while you play the LP and you wont have to be constantly changing your volume knob on your amp during the show. I did not notice any high end loss when I added this pedal to my setup, but when this pedal is really cranked there can be a slight hiss, but nothing out of the ordinary. This pedal is not as clean as the MXR Micro amp with my amps. There is a little more grit to the EH version, not much but it is there. I mostly use this pedal in the effects loop of my amplifiers because I don’t need a change in preamp gain/volume, but I prefer a cleaner boost of volume. 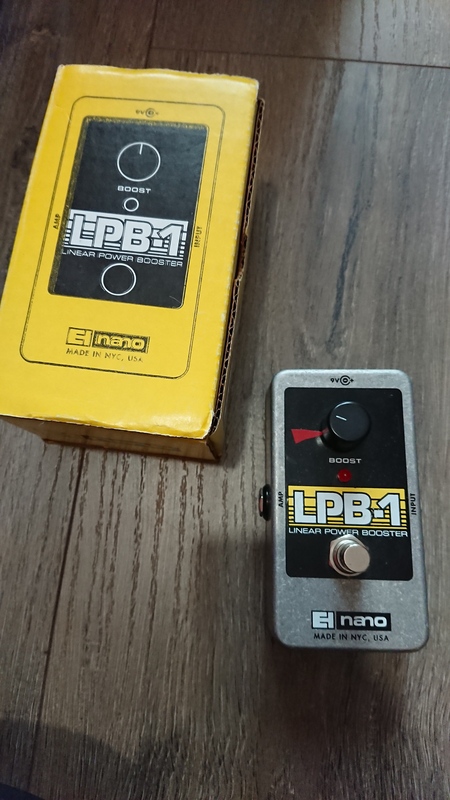 I feel this pedal works better in front of an amp and that the MXR Micro Amp sounds better in the loop because it’s a little bit cleaner. It can push the front end of your amp, provide tons of volume boost in the loop, match signals for different guitars during a gig, and regain a quality signal if many pedals are used in succession. Overall I think this is a great pedal to have in your arsenal. It’s built like a brick and it doesn’t take a lot of space on your board. This is a good pedal, but I prefer the Micro Amp from MXR because it is a little bit cleaner and seems to be built just a tad sturdier. There isn’t a huge difference between them though, so if cost is an issue I’d have no problem picking this one up instead. Well, actually it's not true that I have, but a clone. So the message is: go for it! This little thing is simply indispensable! It beautifies you and boosts your sound "basic" incredible Manire. Matosman59's review (This content has been automatically translated from French)" Superb"
A switch and a knob. I admit that it is difficult to get any easier. A booster gain, volume and bass. Great for a rhythm that wants to spend a little more during the solos ... From the soloist! Or a soloist who wants ... uh ... Booster his solos. For 20 € of Cygnus, it's a great investment! For a bit feeble in the lower bowl, a weakling amp gain, guitars that are a bit body, a 2nd pedaleboard payday (or even the main pedalboard ....). This pedal, c's all good especially for the price.